I have finally managed to create a garment that doesn't look like it has been badly handmade! 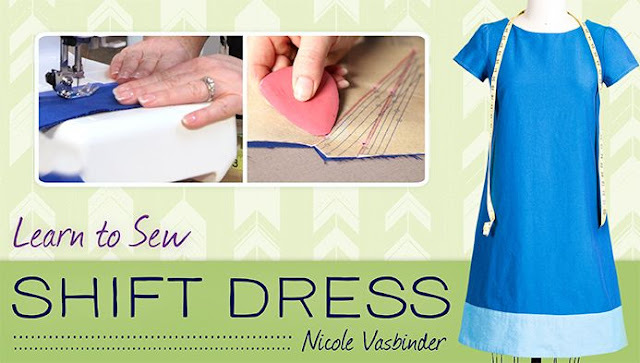 Nicole takes you through the garment process step-by-step, I love courses like that! They actually teach me something because I move through the process with the instructor and learn loads along the way! I must admit that I took it upon myself to not make any shortcuts with this project, to sew and baste and iron when I was told to and to enjoy the process, which I did. I have, until now never created such incredible looking seams! Just look at this incredible looking facing! I would never have achieved that before! The sleeves turned out really well, as did the darts and I am so impressed with the contrast band - it is like I didn't actually sew this dress! Believe it or not, I had just finished ironing it before I took this photo. As much as it is a deficit, the dress feels amazing to wear - perfect for the weather we are having right now. I think I will make another shorter version of this dress at a later date. Have you taken this class? I would love to see - share your FOs from this week below. Nice job! The sewing is beautiful. I didn't realize linen is not nice with ironing. I've got a pattern I've been planning to make that calls for linen fabric. I'm going to have to think twice about that now.